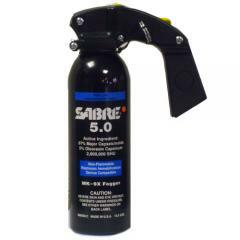 Tame rioting crowds with the 5.0 MK-9 Fogger Spray from Sabre. When it comes to large, unruly groups of people, non-lethal tactics are essential for successful crowd management. The fogger-style sprayer disperses a high volume stream capable immobilizing multiple targets at a range of 25-30 feet. The powerful Sabre formula features 5% OC levels with .67% major capsaicinoids for maximum stopping power. Once in contact with the target, the fast-acting formula immediately inflames the eyes, mouth, throat and nose, incapacitating attackers. The canister features a pistol-grip handle for controlled and accurate deployment. A safety pin and tab prevent accidental discharges. NOTE: Spray cannot be shipped by air or to a P.O. Box. Continental USA only.